In my younger more naive days, I always envisioned my chunky self with a chunky baby with rolls and extra chins. You have to kind of admit...a chunky baby tends to be cuter than a thin baby... as much as I don't want to admit that. 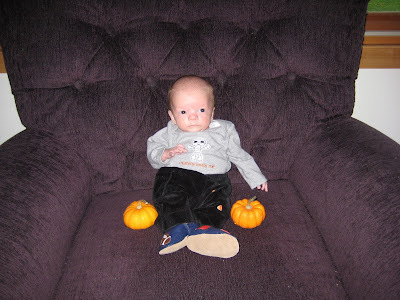 Then I thought of dressing that chunky baby up in something cute for Halloween... possible a round little pumpkin. Cute, right? And then... I had my first baby, and he was 3 lbs 4 oz. Nearly 2 month later, as Halloween rolled around he was anything but chunky. He was maybe 5 or 6 pounds. Maybe we should have gotten him a skeleton costume. Fast forward 4 years, and I'm pregnant again, and everyone is telling me that I'll probably have a 10 pounder to make up for the tiny one before. Of course, you know what really happened. I had a small baby, again... and while she was much bigger than "L" she is still a peanut. I long for her to be a round, chunky pumpkin for Halloween, but she will probably look more like her brother did above for Halloween. And a part of me grieves that... as stupid as it may be. I have small babies, they struggle to grow inside, and once out they struggle to eat and grow on the outside. They will never be little rolls of flesh, never be round, chunky pumpkins. One of the characteristics of Turner syndrome is short stature. The average height of a girl with Turner syndrome is 4 feet 7 inches. Lily is a peanut and will continue to be a peanut. It is in her genetic make up. There is nothing I can do to change that. We have been having regular weight check ups. I call them reverse Weight Watchers, because it is like weighing in, except you are hoping for a gain. Strange world for this lifetime member, that's for sure. As of yesterday she is up to 6 pounds 8 ounces! I rejoice for every ounce. Unfortunately, yesterday she was diagnosed with reflux, and is now on Prilosec. I really hope this makes eating for her more enjoyable (like it is for me HA HA! ), since she has been screaming bloody murder, and painfully spitting up through her nose for at least the past couple weeks. She'll be able to see a sunset. An awesome support system to get her through whatever life has in store for her. And she lives in a day and age where technology would allow her to someday have her own child... if she wanted to! Yes, my daughter will never be big, but compared to what could have been... who cares! I agree with Heidi, my heart rejoices when I see pictures of Lily. What proof that there is a God and He listens to the cries of His people. I just bought Lily some pretty fantastic Christmas presents today, I can't wait to give them to her!!! She can still be a pumpkin, just one of this little pie pumpkins! Those ones make more delicious things anyways :) Also, Prilosec is my best friend, it saves my life!!! Welcome to the addiction little Lily! Inserting something clever about little packages here. I still think she is just adorable and practically perfect in every way. It's really neat to read how you are working through all of this, Sarah. It is so refreshing to hear your honest words and feelings. You may not remember me, I went to college with you for a year at Dordt, and connected with your blog through a link that Jess posted awhile back with a recipe. Anyway, you have been on a quite a journey, and I've enjoyed catching up with it via your blog. Thanks for your work here. Maybe ABOVE average intelligence, don't count her out yet, she looks very smart to me. If you have questions about living with Turner's I would be more than happy to answer as I am a TS girl myself. Sarah!!! I haven't checked your blog for a while and I'm overjoyed to hear about and see photos of sweet Lily!!! Congratulations!!! !